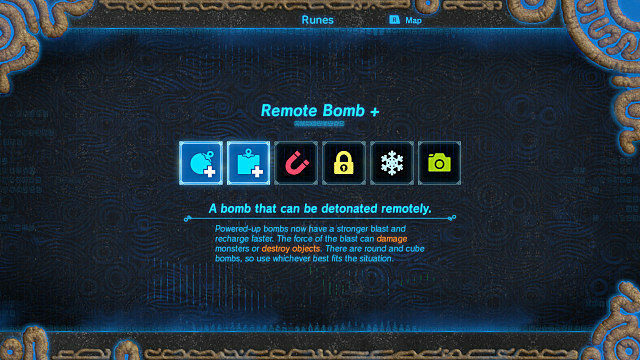 Slate: And another new element to the game that I believe was new to Breath of the Wild were Runes. Obviously there were items and weapons in past games, but Runes were handled quite a bit differently. In one aspect of that was the fact that you get them straight at the beginning of the game. And I wonder how you settled on this selection of Runes that are in the game and what that trial-and-error process was like in getting those just right. Fujibayashi: Initially, we were thinking about perhaps getting items like in the older Zeldas, just in order. But when we considered that this world was an open world and a free world where players could go anywhere, we thought perhaps providing them with what they need from the beginning was important. Especially if players are going to play not in order or not in a specific sequence, we thought it would be very important to have these tools from the beginning. So when we were thinking about items or Runes, we were thinking perhaps doing that from the early stages of development. But what do you guys think? Did you like the idea behind the runes and would you like to see them implemented in a future Zelda game? Let us know in the comments below!